Bestow to the distinctive person of your life this Delightful Pampering 1 Kg Fresh Fruit Cake and let the sentiments linking you two to each other be filled with all the earnestness. Send this Taste Rejoice 1/2 Kg Fresh Fruit Cake to the abode of your fondled one and let sheer wonderment drench the oneÃ¢â‚¬â„¢s heart. 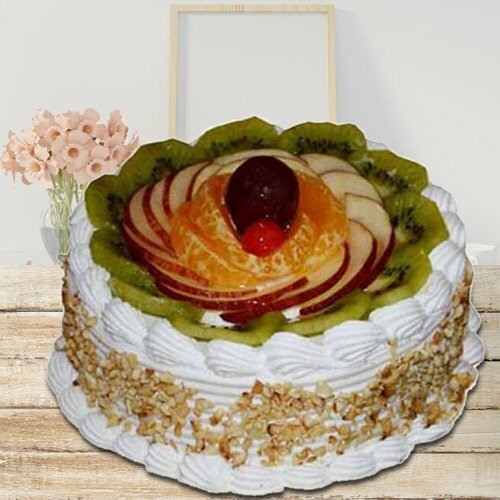 Make your close ones profusely joyful by presenting them this Exquisite 1 Kg Eggless Fresh Fruit Cake and fill their hearts with cherishing thoughts about you.